Announcements about new hires, staff promotions, association news, awards, mergers and acquisitions. Chicken of the Sea's new flavored tuna comes in a single-serve, recyclable plastic cup with a foldable fork tucked under an outer lid. A new final rule changes the National Honey Board importer-handler member and alternate to an importer member and alternate. Announcements about new food and beverage plant construction projects, plant renovations and plant expansions. Kloeckner Pentaplast has new ideas for how meat companies can display products in stores and offer more sustainable packaging. 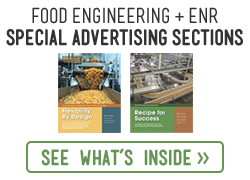 Are you taking steps to advance food safety in your plant? With decades of experience and the knowledge of in-house Microbiologists, Technical Designers, Chemical Partners and Safety Specialists, PSSI's team of food safety experts protects the moments you perfect. Despite ongoing production pressures on meat and poultry operations managers, making the effort to follow best practice sanitary standards can not only enhance food safety and production but also add value to products. Doughnut Peddler had always wanted to invest in metal detection but needed a business justification for the investment. The company's rapid expansion provided the opportunity and the commercial case that it needed. Being able to adapt on the fly is great, but it's a lot easier to do when you've accounted for as many potential contingencies as possible. The Material Transfer Lift & Seal dumper discharges containers of food product into a hopper at 72 in. above floor level. The Gericke Pulse-Flow PTA dense phase pneumatic conveying system features a feeding hopper, pressure vessel, pipeline, conveying and secondary air supply, and computer-driven touchscreen control system.